The problem with becoming aware of and trying to participate in "Flannel Friday" is, as I said last month in "Flannel Board Free" that I don't really do flannel boards. I am a storyteller. Flannel boards (magnet boards) were where I started. But if there's a way to use a prop, a puppet, any gimmick that enables me to TELL a story, that's where I'm headed. 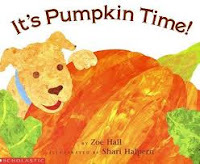 This week's "Pumpkin" program is typical of what I like to do. I DID have this terrific book, which I could have just read to the kids, and I have done that in the past. But mostly I used it just to show them the steps in how a pumpkin grows as part of telling a story that is sometimes called "The Story of A Pumpkin" and that I just call "Feegbah"
If you listen to the podcast, you will hear that I am trying to get the kids involved in the story from the moment they look for an imaginary pumpkin seed behind their ear to the end where they become the cows tossing "Feegbah" high into the sky. They become trees and they bend to one side and then another.They become houses and stretch their arms above their heads. It's active storytelling and where I go, they follow. I have told "Feegbah" for many years and I never get bored of telling it. I never get bored telling it for 5 times in a week. Because a story is ORGANIC, not in a misty, New Agey nonsensical sort of way, but because the audience is never the same. I am never the same. Each time, the story changes depending on who I am telling it to. I listened to this story and realized that it had evolved again this year. When the Kid taunts Feegbah, this year I danced around going "nyah-nyah-nyah NYAH-NYAH", the time honored chant of my Bronx childhood. And the more the kids giggled, the more I hammed it up. The other story I did this week was based on a Bengali tale usually called "The Old Woman and the Pumpkin", which I told with puppets. Again, I have told this story for years--Guitar Lady and I did it long,long ago as a puppet show in the park at Halloween, but it too keeps changing. Never having liked the ending where 3 wild animals quarrel over who gets to eat the Old Woman while she slips away, I happened to remember the Jessica Souhani version of this story and discovered in that version the Old Woman fools the tiger into thinking she is still skinny and unappetizing by poking her walking stick out of the pumpkin as if it is her arm! That's a nicer, gentler version of the story, so I used that. I was hoping to make up a flannel board version of this and film it, but I still haven't found an old lady cut out, so I've put it on the back burner. We also sang "Five Little Pumpkins" and "The Pumpkin Song" I podcasted in my last post. But these two stories are long, and were plenty for story time! Thursday afternoon, instead of doing another boring pumpkin craft, we made apple cider donuts. I will post about that on "The Library Lady Cooks" when I get a chance. And now it's time to get ready for Halloween!